Happy National Moth Week! Mmm, didn’t know it existed? Well, walk around at night in your yard with a flashlight and what will you likely see? Moths taking over the night shift of pollinating flowers. Like butterflies, moths don’t actively gather pollen. While they are foraging for nectar, pollen grains stick to the moth’s body and tongue and are spread flower to flower. Moths don’t have jaws so they don’t eat any of the pollen. They only have an elongated straw-like tongue called a proboscis which they uncoil to drink nectar. Since different species of moths fly at different times of night, you are bound to meet new “moth friends” by varying your witching hour explorations. Moth-pollinated flowers tend to be white, pale yellow or pale pink. The flowers are typically in clusters, open late afternoon or night, and are ample nectar producers. They usually have a strong, sweet fragrance as night-flying moths depend heavily on a developed sense of smell for feeding and reproduction. Hawkmoths can detect the scent of a flower over a mile and a half away! Moths are just starting to get the credit they deserve for pollinating food crops and garden plants. Check your strawberry and raspberry plants at night and I bet there will be some moths helping to ensure your bountiful summer crop. Garden flowers frequented by nocturnal moths include flowering tobacco (Nicotiana spp. ), madonna lily (Lilium candidum), night-blooming jasmine (Cestrum nocturnum), moonflower (Ipomoea alba), white spider flower (Cleome hasslerana) and evening primroses (Oenothera spp.). With days of working long hours and some with equally long commutes, gardeners are increasingly enjoying flowers at night by planting aptly-named “moon gardens” with these plants and other white or light-colored flowers and shrubs. 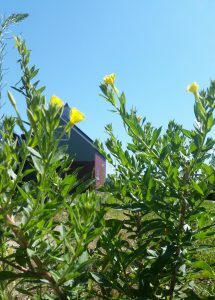 The evening primrose is a tough-as-nails biennial for your drought tolerant garden (eleven species found in New York, six are native). All flower at night with a sweet fragrance that attracts hawkmoths and a group of parasitic moths whose caterpillars eat the seeds. The primrose moth (Schinia florida) is bright pink with a band of yellow at the end of its wings. They emerge from their cocoons in synchrony with the yellow blossoms of the primrose each summer, and rest on the stalks and inside the flowers. The moth’s yellow-tipped wings match the petals of the flower which close around it during the day. Night flying moths use the light of the moon to help them navigate. Because the moon is so far away, the moth perceives that the light rays are coming from the same general direction. The moth is able to fly in a straight line by keeping these rays at a constant angle to its body. Outdoor artificial lights disorient moths because they never expected to get to the moon! With an outdoor light, the light rays radiate in all directions. The moth desperately tries to keep these rays to one side of its body, changing flight direction in all topsy-turvy ways to compensate – even bumping into the light bulb in all the craziness. Moth numbers have been in long-term decline due in large part to habitat loss and climate change but also because of artificial night lighting. As one might expect, moths are significantly distracted from pollinating and mating because of their attraction to the residential and street lights. In a recent study, only half the amount of moths were found at ground level in lit sites compared to unlit sites. Because the moths are attracted upwards away from the fields, there were significantly fewer moths carrying pollen at lit sites. While all lights attract moths, moths are attracted to ultraviolet and white light more than red and yellow light. Not thinking of celebrating National Moth Week any time soon? I leave you with one final thought. Moths are key food sources for owls, bats, frogs and birds (if they discover them during the day). If you like these glamour animals then you gotta love moths too!